After a few false starts, I finally just made THE SAME OLD DRESS I’VE BEEN MAKING FOR THE LAST FOUR MONTHS. Here’s a post where you can see the lines of the dress. It’s the Simplicity 2389 bodice with the (heavily modified) Burdastyle Heidi skirt. And now I have a navy dress. My brother-in-law and nephew both got married in kilts. At my nephew’s wedding both father & son were in kilts. Hi Erin, looking good, both of you! I’ve been vaguely interested in kilts for ages and much more so since a recent trip to Scotland (during which I saw many more than a tourist’s usual share of men in kilts because I was Edinburgh on the day of the referendum and kilts seemed to be worn as an expression of Scottishness, independent or British). I can’t find a McKean tartan in my book on tartan but that only includes 150 design, so that doesn’t mean anything. The tartan of your brother’s kilt looks a bit like MacDonald of Kingburgh but it’s not quite the same. Kilts are cool right, in more ways then one I guess and he looks very dashing in his tartan ensemble. Navy suits you so I’m glad you have a very lovely new dress – to go with the shoes and weddings and whatnot anywho! I must look up the significance of lavendar for a wedding. Interesting. PS what is it with silver wedding shoes. I had some and they were torture. Silver shoes are both versatile and festive. It’s a shame nobody will make some that are comfortable. It’s not hard to make shoes that are both dressy and comfortable. I know because I do have a couple of pair but unfortunately only in black. We had a Scottish themed wedding in March. 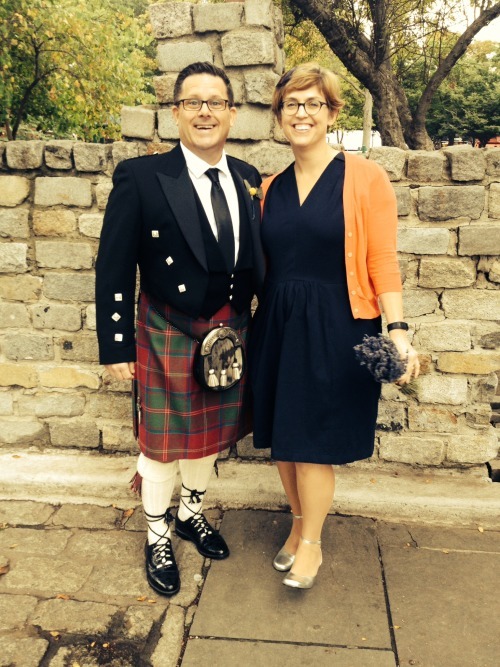 No kilts, but we did have our tartans, and did a handfasting ceremony. And thistle in my flowers — I thought at first that you had thistle too. I love my Scotsman!